"It has taken evolution 6 million years to perfect the foot. Now it has reached the sock" - Prof. Bodo W. Lambertz, X-Sock designer in chief. 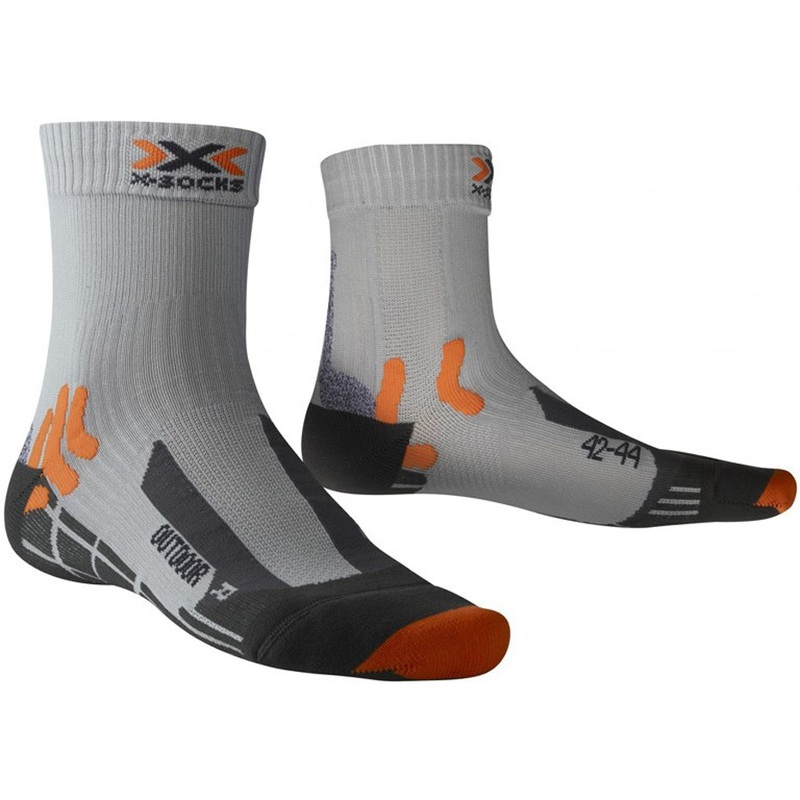 X-Sock's Outdoor sock is developed for demanding treks on and off groomed trails. As a low cut, above the ankle sock the Outdoor will go great with a sporty trekking shoe, approach shoe or low-cut boot. An anatomically shaped footbed - Because our left and right foot are not the same, X-Socks have made each side complement the form of each foot. Support is put in higher pressure areas to support the natural rolling movement of the foot. An enhanced Heel Protector absorbs friction and therefore reduces the risk of blistering while on the opposite end your toes are treated to a reinforced Toe Protector and Toe Tip Protector, both of these are are asymmetrical, again fitting to the natural contours of each foot. Impact-absorbing protectors made of hollow-core Robur fibres will cushion and protect your toes as well as reducing the chance of blisters and chafing. X-Socks recognise that the arch is a place that strikes the floor the least so they placed an Air-Conditioning Channel along the arch and up the cuff; you can identify this in the photo where the material in the arch is sewn in a different pattern. Harder to see are the Aircool Stripes and Traverse Airflow Channel System which are lateral ventilation channels under the sole and channels directing airflow upwards. The combination of these creates ventilation to your feet and wicks away any sweat. The idea is that with every strike you make, air from the gap of your arch is circulated up and out creating a ventilation system that dries, even in snug-fitting shoes.